Over the Rainbow: A big thank you and some scrappy goodness! So today is Mother's Day. The closer I get to being a mother, the more I appreciate all the things my mother did, and still does for me. And without going into details, I'm pretty sure I wasn't the easiest kid, either! So if you're reading this mom--thank you. I love you so much. And, in honor of National Scrapbooking Day (I'm a day late, but too much celebration can be a good thing, right?) I have a scrapbook layout for you! The monthly challenge over at Write. Click. Scrapbook this month was to scrap a day in your life. I created a similar layout almost two years ago, and it's funny how much has already changed! In between the two layouts, we've both graduated, so our daily schedules are really different! Since I was running low on time and didn't have time to order photos (reason #4566677 why I need a Canon Selphy as a birthday present! ), I decided to just use a random photo of myself and focus the layout on the journaling. I kept track of what I did all day on a notepad, and then typed up the schedule as journaling. Using my typewriter, I was able to (mostly) navigate around the embellishments to get all the writing in. I used the Studio Calico April kit on this one. 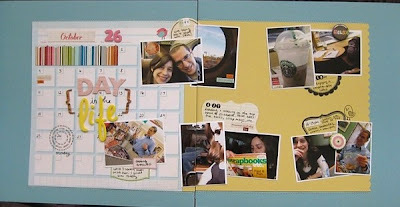 While days like this one (lots of scrapbooking, visit to the mall with a friend), aren't exactly my everyday life, I still love how this layout captures a moment in time in a really detailed way. Check out what the rest of the WCS girls did here. So when was the last time YOU created a Day in the Life layout? And what are YOU doing for Mother's Day? i loved your layout in the WCS gallery, keshet! Pretty card! And the layouts are awesome! I need to do a layout like that! Its been way too long. Thanks for the awesome inspiration. Love what you did with the shipping tags on this one Keshet! Very pretty card...and fabby layouts as usual. I hope you're enjoying your weekend. So pretty. Your LOs are just so lovely. Hmmm...haven't done a DITL LO before. Might have to put that on my list! Thanks! Love your latest "day in the life" layout. That photo of you is great! I like what you're wearing! Keshet, is it too cheesy to say that I love you? You have a good heart - and your day will come. I know it will. 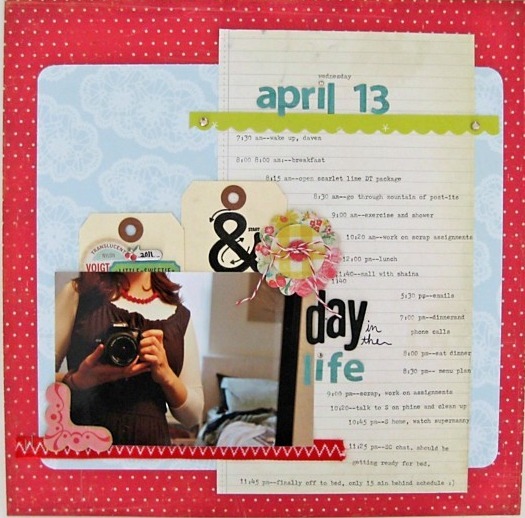 I really love your Day in the Life layout! Fabulous! Your journaling layouts always rock! BTW, I couldn't have breakfast in bed. Too much help involved (both wanting to help and sit beside me, huge potential for spills) so I opted for sitting surrounded at the dining room table with three sets of eyes watching me consume every crumb of breakfast :) And I had to consume every crumb! LOL! It will come scrappy friend! Hang in there! Fun Day in the Life pages! I love how you used the tags! Beautiful projects! I especially love that thank you card and the pop of color - really beautiful! Lovely projects! :) The card is such a fun colorful card and the layouts are just fab! Hope you had a lovely Mother's Day! I just know you are going to be a Mama very soon:) LOVE that picture on your day in the life LO! Hope you are having a great week! LOve, love, love the April 2011 layout. I think this is a great idea too & want to do one of my own soon. Also, love your card! I have such trouble with them!